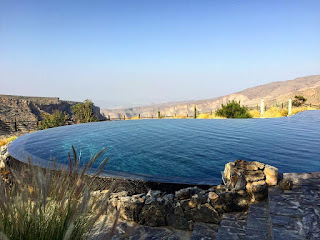 Since I turned into a self-justifying, sanctimonious tourist, we've stayed in some pretty amazing eco-friendly places- like the towering bamboo house at Green Village or earthen built villa Dar Camel Rock- but I've never been anywhere quite as remarkable or as environmentally sensitive as Alila Jabal Akhdar. The LEED designed hotel blends seamlessly into the rock face of Jabal Akhdar, part of the Al Hajar mountain range, one of the most spectacular landscapes anyone can ever see. Each week, the resort fills with locals and Muscat residents wanting a glimpse of Green Mountain, a cocktail in the clouds, or simply an escape from the Arabian heat (situated on a plateau 2000m above sea level, Alila Jabal Akhdar is 15 degrees cooler than anywhere else in Oman). This initially worried my husband and I, since, like Sartre, we think l'enfer, c'est les autres. While others travel to meet people, we travel to get away from them. Our fears were quickly allayed. Despite its already legendary status, the hotel retains an air of friendly exclusivity. Everyone was polite, hospitable, and relaxed, but never obnoxious (perfect for families with kids, even small children, yet couples and solo travelers will find their need for privacy and quiet respected). Being guests at Alila Jabal Akhdar felt like being part of a special club, as if we all got golden tickets to Willy Wonka's factory, but instead of sharing our visit with Veruca or Augustus, we were all Charlie. The luxury resort is literally heaven on earth, featuring an outstanding viewpoint encircled in glass. Once you experience the quiet and clarity of vistas from this hotel, the more touristy Diana's Viewpoint seems like a funhouse mirror version of a better looking guy, only it is just that guy. The two hour drive from Muscat to Alila Jabal Akhdar is well marked and fairly straightforward. After a police checkpoint, steep elevation and winding s-shaped curves will take your breath away, but the roads are excellent and intrepid drivers are rewarded with sweeping views of limestone canyons, richly mottled cliffs covered in fossils, and goats crossing red clay riverbeds or seeking shade under olive trees. Damask roses and juniper trees grow in the region (rosewater is a famed local specialty), motifs appearing throughout the warmly decorated, minimalist resort. Woven rugs, textiles, and pottery from Bahia and local Omani artisans support the surrounding community. We booked a horizon view room but were upgraded to a stunning Ridge View Suite twice the size of our Paris apartment- the terrace alone dwarfed our flat in the 7ème, and sweeping canyon views made our tired Eiffel Tower / Invalides shtick pale in comparison. When we arrived, an Omani man greeted us with a cool jasmine scented towel and lemon mint drink before leading us to our suite. He made me close my eyes and had my husband lead me onto the terrace, replete with daybed and dining area. He recommended we watch the stars out there, which we did every night. Up in the mountains, you can see two galaxies with the naked eye and shooting stars fly by every so often. It made us feel small and insignificant and wonderful. We also had a full soaking tub which looked out onto the mountains and a separate balcony with couch. Every morning before my husband woke up, I'd fix myself a cup of mint tea and sit out on the couch, but I couldn't sit long because I just had to peer over the railing into the gorge and breathe clean mountain air and watch wind rustle desert brush and admire the stillness and serenity of it all. I've never experienced silence like that before, not even in the Empty Quarter. You can walk all along the edge of the canyon and spend a week just exploring the grounds. There's a zipline, wadis, forts, abandoned villages (Sarab is a local favorite) and organic farms in close proximity, where friendly farmers offer passersby gifts of dates, walnuts, and pomegranates. We borrowed bikes from the hotel, and despite both of us puncturing tires on jagged rocks, had an amazing time biking to the A'roos and Saiq plateaus, passing some of the oldest trees in the Arabian Peninsula, including 3000 year old junipers. Can you believe I thought Whipps Ledges or the Canal Towpath in Ohio as a child would prepare me for biking at this altitude in some of the most rugged terrain known to man? Swimming Jabal Akhdar's clear wadis and fresh mountain water made my hair really soft, curly, and manageable, even though it looks like Slash in these pictures, and the resort has two beautiful jacuzzis if you want more privacy. Don't miss Jebel Shams and Wadi Bani Awf, where sometimes there are so many butterflies you can barely see your own feet in front of you, and you can look down at turquoise wadi pools straight through to the desert. 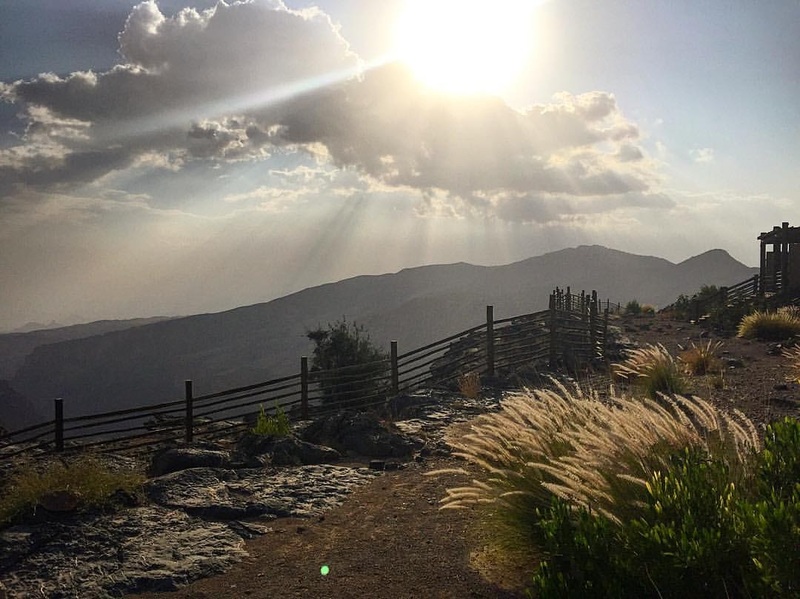 As can be expected, there aren't many restaurants on the mountain (only a few, and some fruit stands), but Alila Jabal Akhdar has two fantastic ones: Juniper and Rose, named for regional specialties. Both offer great views of the pool and canyon and stars by night. We took half board, with the best breakfast buffet ever plus dinner included. The menus change every night since they buy from local suppliers, but there are lots of vegan and gluten free options, including fresh mezze, pomegranate-laden seasonal dishes, and warm gluten free bread to dip in olive oil and za'atar. I loved the pine nut sorbet and chestnut gluten free cake, as well as local Omani chocolates from Salma's, from date sweetened truffles dipped in sesame seeds to lemongrass and rosewater cacao bars. Alila Jabal Akhdar is one of the few resorts in the area with a liquor license; along with an impressive whiskey collection and wine list (including rosés from Lebanon), they offer great rosewater and pomegranate infused cocktails. Service was the best our whole trip (better than the Chedi... everything was better than the Chedi), and we especially loved Albert and Vladimir, they were so sweet! 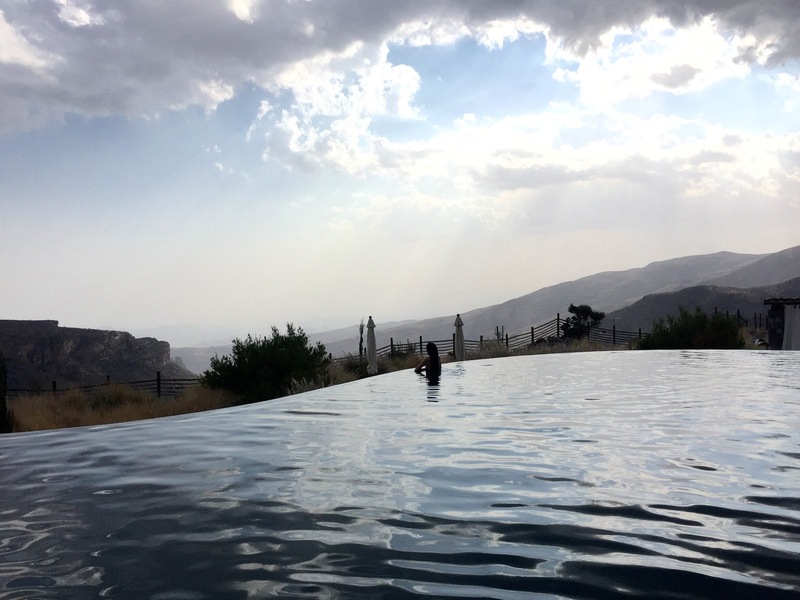 Alila Jabal Akhdar's design preserves the natural beauty of the region, using active and passive solar systems and sustainable, local, or recycled materials. The stone cladding was carefully excavated from Jabal Akhdar itself, and certified sustainably sourced wooden beams form the resort's railings and fort-like doors. It's a beautiful example of traditional Omani architecture, refreshingly free of the colonialist influence marking other hotels. Water conservation and plastic pollution prevention are crucial to Alila Jabal Akhdar's operations, with zero waste friendly refillable handmade toiletries in every room, dual flush toilets, low flow showers and taps, recycled wastewater irrigation, non-disposable tableware, fully biodegradable cleaning products, and native plant landscaping. Our favorite was house-made mosquito repellent, a blend of lavender, lemon myrtle, and geranium oils that protected far better than DEET. Also- this has nothing to do with sustainability- but the indoor pool, steam room, and spa are incredible here. 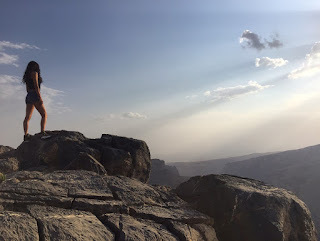 Props to everyone who worked on Alila Jabal Akhdar, because no detail was overlooked. It's the most thoughtful and exceptional place I've ever been. I think you may have found paradise. Thank you for sharing. Though, Corsica for a honeymoon wasn't all that bad either. I thought of you and your wedding, I'm sure you were the most beautiful bride, wishing you lots of happiness! Corsica sounds wonderful <3 It really is paradise here too though! Your pictures are so beautiful ! isn't it very hot in Oman at this time of the year ? Hello Pandore, how are you? Yes, this is the low season because of 40°+ temperatures, but it was really ok, even in denim, as long as you're near a pool :) The wadis get a bit hot with all the climbing but fortunately there are nice fresh natural waters to cool down in. Thank you!! We considered bringing a real camera but even with the phone and no editing the pictures looked fine to me, Oman is so beautiful it doesn't even need anything!